At Baxter Real Estate we are a family run business founded by Kevin Baxter in 1978 when he opened in Blanchardstown village. Over the next four decades Kevin built a strong brand which became synonymous with high standards and a commitment to achieving the best results for our clients. Baxter Real Estate is now run by Kevin’s two sons Declan and Damien Baxter and aided by Damien’s wife Marie along with an enthusiastic and professional team. Both Declan and Damien are fully qualified Chartered Surveyors with Degree’s from Trinity College Dublin. At Baxter we recognise that our job is not just about selling bricks and mortar; we are in the business of helping people to move and deal with their property issues. We understand the stresses and emotions involved with property transactions, and we use all our experience to make sure that the process runs as smoothly as possible. We are absolutely confident that our professional approach and hard - working ethos will deliver a service that won’t be matched. 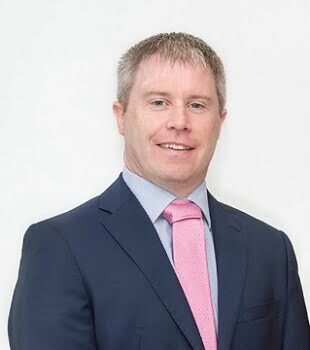 Declan has a Bachelor of Science Degree in surveying from Trinity college, a Diploma in Property Economics from Bolton Street DIT, a Diploma in Arbitration Law from UCD and is an APC qualified RICS Registered Valuer with full membership of the following professional bodies. Declan joined the long established Mason Owen & Lyons in 1999 and, at Director level, acted for many high profile clients such as Hibernian and Irish Life. Following a seven year period with Mason Owen & Lyons, Declan moved to Harcourt Developments, one of Irelands largest property companies, taking up the role of a Senior Property Executive for a nine year period. Working on the client side has provided Declan with an invaluable insight into the service that should be provided to all clients and this ethos is at the core of Baxter Real Estate. Marie and her family live in Sandyford and moved there in 2007 from Castleknock. When Marie started looking for her new home in late 2006 she fell in love with the Sandyford area, she knew it was perfect, a central location with a wealth of facilities nearby from the award-winning Dundrum Town Centre, the picturesque Three Rock and Tick Knock Mountains and the quaint village of Sandyford itself. Marie has been in the property industry since 1997, February 6th to be exact, she remembers the day quite well it was the day she started working in Baxter Auctioneers in Blanchardstown and Marie fell in love with the property industry. Over the years Marie learned the modus operandi of an estate agent and studied for various courses with the Institute of Professional Auctioneers and Valuers. Marie spent a vast amount of her working life with Baxter’s, but more recently with Sherry Fitzgerald in their Bray office covering South Dublin and North Wicklow. During her time with Sherry Fitzgerald Marie was involved in the sale of many high profile properties throughout South Dublin and North Wicklow and gained and in depth knowledge and expertise of a wide geographical area along with an excellent understanding of the latest property marketing techniques. Damien grew up in the picturesque village of Castleknock and it was in late 2006 he moved to Sandyford. Finally early in 2007 they settled on a house in Sandyford which had views of Three Rock and Tick Knock Mountains. It was within walking distance to Sandyford Village where he hoped of one day opening a new office of Baxter Real Estate. Damien has been in the property industry for 24 years, cutting his teeth with DNG in their City Centre branch when he first graduated from college with a degree in Surveying from Trinity College Dublin and a Diploma in Property Economics from Bolton Street, DIT. Damien’s father had been running his own estate agency business out in Blanchardstown at the time and a short while later Damien was asked to join him. For over 20 years Damien and his Dad, Kevin Baxter worked side by side in the family business selling and letting property all over Dublin and sometimes even in Wicklow and Meath. In more recent times Damien gained experience working with estate agents Sherry Fitzgerald in both their Dundrum and Templeogue branches. During his time with Sherry Fitzgerald Damien was involved in the sale of many high profile properties throughout South Dublin and gained like Marie an in - depth knowledge and expertise of a wide geographical area along with an excellent understanding of the latest property marketing techniques. At Baxter Real Estate, Damien offers the latest marketing and sale innovations on a personnel level that won’t be matched.